People who work in the tech sector, especially those in the startup community who could name a hundred companies off the top of their heads and know they could easily find hundreds more from a growing list. Folks in the finance/venture capital sector, since the blame for this "vanishing" was laid at their feet. But while you could quibble with—and sometimes flatly refute—some of the claims in the story, it does point to a key issue that shouldn't be quickly dismissed. The essence of that point was captured in this line: "for the first time in at least a generation, Canada lacks a single, healthy large-capitalization tech champion." 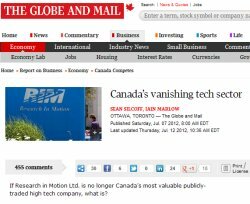 The Canadian tech sector hasn't vanished, but it is fading from mainstream radar screens. And that could be a problem for the sector, especially when it comes to government policies and programs that have assisted so many startups over the last few years. Those of us who work in and around the tech sector can be oblivious to the bubble we float in. If you want to come back down to Earth, just ask the average person who works outside of tech to name five Canadian tech companies. They'll (nearly) all know RIM and may know some local firms, but if they can come up with a few from outside of their own area they're doing very well. That was true five years ago and 10 years ago as well. Not only have Nortel and RIM been the exceptions, they've also been, for a generation of Canadians, the company everyone knows in a category where they're aware that there are several other companies but don't really know much about them. The entire Canadian tech sector was immersed in the halo effect they generated. In Waterloo, we quickly learned the value of having the industry icon in our own backyard. Thanks to RIM, people were ready to believe that a lot more was going on in Waterloo than was really the case for many years. We put that belief to good use, attracting the resources needed to help the reality catch up to the belief. RIM actually contributed very little—directly—to the creation of Waterloo's startup community, but its indirect contributions were significant. Few startups in the Waterloo area haven't taken advantage of resources that came to the community partly as a result of the halo effect that RIM engendered. But it's not just Waterloo. The near-simultaneous collapse of Nortel and rise of RIM couldn't have been timed better for psychological impact. We had the threat and the hope—the dire things that could happen and the proof that we could still create great, world-class tech companies. You couldn't ask for a more motivational combination. Governments were particularly motivated. Over the last few years, hundreds of millions of dollars have been poured into the tech sector, through new programs and agencies like ONE, CECR, and FedDev and through additional funding for longstanding programs such as IRAP. Here in Ontario, we've also seen the federal and provincial governments kick in money to stimulate venture capital investment. We've seen greatly expanded services from organizations like MaRS and Communitech, the creation of new innovation centres providing services to startups and early-stage tech companies in Hamilton, Guelph, Windsor and many other places, and funding for new commercialization centres in Waterloo, London, Hamilton, and elsewhere. It would be hard to find many tech startups in Ontario that haven't received some benefit from these programs—in many cases, the benefits have been substantial. Did government really care about supporting a five-person startup? I think the bigger motivation was "finding the next RIM." Not that these startups were realistically ever going to be RIM-sized, but RIM was the mental model of what a Canadian tech startup could become and that legitimized the entire sector and the level of support it received. When people ask who the next Canadian tech darling is going to be (and RIM has no plans to let go of that spot, although I think it's fair to say its grip has loosened), I'm not sure they realize what an exception RIM is. Of the companies with Canadian headquarters listed on the TSX—most of which have reached a size that few of our tech startups will ever match—nearly 95% are from outside the technology sector (although the TSX also has separate categories for cleantech and life sciences firms which would lower that percentage if you use a broader definition of technology). By market capitalization, the largest Canadian-based company in the category is IT services firm CGI, followed by RIM and OpenText. The next four—CAE, Constellation Software, MDA and Celestica—are all billion-dollar-plus companies ... and have a combined 54 followers on Twitter (30 for Celestica and 24 for CAE; couldn't find Twitter accounts for the other two). As a business owner, I'd take market cap over Twitter followers too, but none of these huge companies will ever be the flagbearers that RIM has been. If they were going to be, they would have been by now. At the other end of the scale, we have companies like Hootsuite with over three million Twitter followers and a top-200 Alexa ranking—outstanding numbers that have helped make the company a success story that Canada's startup tech community points to and is inspired by. But it has fewer than 250 employees—which is still bigger than FreshBooks and Shopify and other startup community favourites, but to a mainstream audience, that's not much at all. And for every company of that size, there are hundreds that will never grow to be the size FreshBooks is today. I don't look down my nose at 200-employee companies and neither does the startup community. In fact, we can get excited by companies with teams smaller than 30. But not everyone feels that way. There is increasingly a mood in Canada that we've been wasting too many resources on small startups that will never become large firms when what we should be focused on is supporting companies on a path to become billion-dollar businesses. Some would say good riddance to government programs and handouts, but there's no denying that much of the startup ecosystem that has been developed over the last few years in Ontario has been driven by government policy and support. Those policy choices have also shaped private sector investment in the sector. If the motivation to find the next RIM has started to fade, the task ahead is to explain to policymakers and Canadians in general why having a thousand microbusinesses that few people outside of our little enclave have ever heard of is a sign of a healthy industry that is worthy of support and investment. I don't have stats to point to, but there seems to be more Canadian tech companies today than at any time in the 15 years I've been following the sector. The sector isn't vanishing—I know that, and you likely know that. But our neighbours probably don't, and the Globe story was a good reminder that mainstream perceptions in Canada may be very different from our experiences ... and that those perceptions could have significant consequences. In the startup world, you hear every day that ideas are typically a dime-a-dozen and the real challenge is execution. It's not just true for startups. Over the last year, I've seen over and over again with economic development in small urban and rural areas that there's no shortage of good ideas (or of mediocre and poor ones, for that matter), but there are formidable barriers to execution. Sometimes it's having the experience and expertise to filter out those good ideas or in overcoming inertia and complacency, but often it's the challenge of putting together the necessary resources—money and people, in particular—to implement them. I was reminded of that again last week when Norfolk County Council voted to postpone its decision on funding much of its economic development strategy ("Norfolk told to move on economic development," Simcoe Reformer, July 3). The strategy was developed last year and further refined earlier this year in a process that involved hundreds of people in the area, along with an Ottawa-based consulting firm and Norfolk County staff. The vision of the strategy was for Norfolk County to be a "community where innovation, technology, entrepreneurship and collaboration drive the local economy." The initial draft from last October was a bit of a grab-bag with dozens of ideas. No one was under any illusions that they could all be implemented, especially when some of the ideas were ways to generate even more suggestions (a business symposium, an entrepreneurship forum and an "agriculture summit" were all suggested in a single two-page section ... a small-business forum was suggested a few pages later), but the ideas covered some vital areas, such as entrepreneurship, youth entrepreneurship, and innovation. But, as with startups, ideas are the easy part. Someone has to execute these ideas and there's only so much you can add to the workload of a small team. In Norfolk County's case. there were a few ideas that were relatively straightforward, but the heart of the strategy was going to require people and dollars to implement. Not huge amounts, but some. And that's where much of the economic development strategy has fallen into limbo. The resources to execute the plan aren't in place and council isn't ready to provide funding for them. Norfolk County certainly isn't unique in that regard. Budgets are tight and aren't likely to get looser any time soon. Coming from the innovation/commercialization side, it's been an eye-opener. "Innovation" has been the colour that provincial and federal governments have been buying for the last six years or so. If you needed $100,000 to fund an initiative, you could probably find the money somewhere. It would take some work, and you wouldn't always succeed, but there's plenty of money in the system. It's a very different story with small urban and rural economic development. There's not a lot of money in that stream and it's much harder to raise funds to implement even the best ideas. Small urban and rural economic development may not have the cachet of innovation/ commercialization, but our future prosperity depends on it. Having gone across most of Southwestern Ontario, I've seen the potential in places like Norfolk County ... and Sarnia and Chatham-Kent, and others. We can come up with all kinds of strategies and plans, but it won't get you very far if you can't execute. 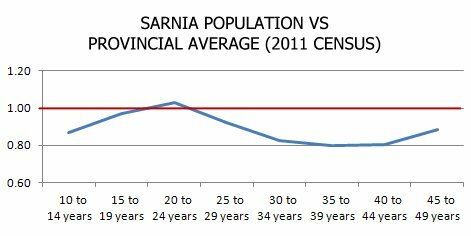 Over the years I lived in the City of Waterloo, it always had a much younger population than the national or provincial average—something you'd expect in a city with two universities and a population of just 100,000 (even though students are counted in their "home" regions by the census). 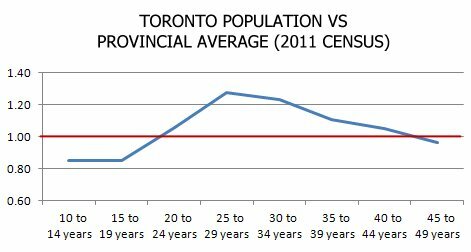 That remained the case with the 2011 census, where Waterloo's median age was 37.6 compared to the Ontario median of 40.4—and where Waterloo had 16.4% of its population in their 20s, the largest number among the 11 communities I looked at and well above the provincial average of 13.0%. But once you break down the numbers a little more, Waterloo's youthfulness definitely faded between the 2006 and 2011 censuses. Its median age was up from 35.4 in 2006 and Waterloo showed a decline in every one of the nine age categories under 45 with the exception of 15-19, where it essentially remained flat. Of the 11 communities I looked at, it was one of only three that showed a drop in its number of 20-somethings (Windsor and Chatham-Kent were the other two). 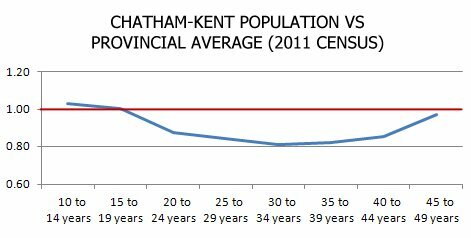 It's easier to show a decline when your population is skewed toward people in their 20s, but Waterloo also showed a huge decline in population among people in their 30s—with Windsor and Chatham-Kent again the only two with bigger drops. Waterloo ranked 9th of 11 in population growth among people in their 20s, their 30s, and in the 20-44 range. The leader in all three categories? The City of Kitchener. It may go against the traditional image, but as of the 2011 census, Kitchener had become a (slightly) younger city than Waterloo, with a median age of 37.2, and with huge gains in its population between 20 and 34 years old between 2006 and 2011. So Kitchener is now the youngest city in Waterloo Region. If it's any consolation to Waterloo, Cambridge still has nearly five months on you. FedDev today officially announced the $12 million funding for the Western Ontario CFDC Association that I mentioned last month (see "Some FedDev fundings from January, February, March," June 5). The money is being used to create a new fund that will provide knowledge-based small and medium-sized businesses loans of up to $500,000. All of Southwestern Ontario is in the region covered by the new fund. The Eastern Ontario CFDC Network has received $8 million for a similar fund for that region. Together, FedDev is calling the two new funds the Southern Ontario Fund for Investment in Innovation (SOFII). Businesses can receive loans from $150,000 to $500,000. FedDev says companies will use the money for "all aspects of innovative SME growth challenges, including: late stage commercialization, new product or service development, new applications or markets, and development or implementation of new processes or technologies." Although the core programs of CFDCs have focused on rural areas, when I talked to the WOCFDCA they said that, for this fund, they wanted to work with companies in urban areas as well. On the SOFII website, it says that "knowledge-based industry includes, but is not limited to, firms involved in pharmaceuticals, health biotech, new materials, telecommunications, information technology, software, medical equipment and avionics." Southwestern Ontario will be served through the office at the Sarnia Lambton Business Development Corporation. UPDATE: This line from the SOFII website about eligibility was a little deflating: "Eligible organizations will: Employ 50 to 500 employees, or identify that there is a strong likelihood they will reach 50 employees within the term of the loan." Since there's less than two years left in FedDev's mandate, there aren't many early-stage tech companies that would be eligible.